The most comprehensive book on greenhouse gardening available today. Today, greenhouses and sunrooms are real living spaces where gardeners spend as much time with a book and a cup of coffee as they do with a watering can and a pair of pruning shears. In this fully revised edition of a best-selling classic, veteran gardener Shane Smith embraces this new "lifestyle" approach to greenhouse gardening. Through lively writing that balances wit with commonsense advice, Smith draws on his more than 20 years' experience to cover everything you need to know to establish a charming and productive greenhouse. Since its inception in 1977, Shane Smith has served as the director (and co-founder) of the Cheyenne Botanic Garden, Wyoming's only public botanic garden. It is a people-oriented, solar heated and powered project. Under his direction, the project has received recognition awards from Presidents Reagan, Bush (senior) and Clinton. The project also received the community hero award from Wyoming Governor Geringer. Smith has a degree in Horticultural Science and has attained Registration as a "Horticultural Therapist HT," from the American Horticultural Therapy Association. He also served a year as a Loeb Fellow in Advanced Environmental Studies at Harvard University, where he both lectured and pursued studies in design, community issues, and leadership. 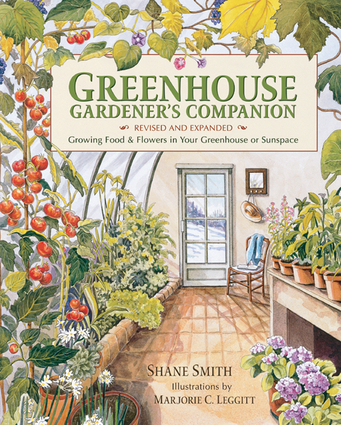 Greenhouse Gardener's Companion is Smith's third published book. He currently produces a weekly garden-oriented radio program. Additionally, he has consulted and lectured on gardening, horticultural therapy, greenhouses, and community greening for over 28 years in 27 different states as well as Mexico, Venezuela and Canada.